Why is my pumpkin teal? Read on to find out! Of all the food-centric holidays we have, Halloween is particularly pernicious, as kids young and old are faced with forbidden foods at every turn. Gluten, dairy, and other allergens lay in wait, eager to spoil the holiday with an accidental exposure that ruins all the fun. But fear not, because there are plenty of ways to enjoy Halloween night free from the fear of whatever allergens you must avoid. All it takes is a little creativity, vigilance, and teal pumpkin or two! To help you put the finishing touches on your Halloween plans, I'm giving you some of my favorite tips and tricks, and am even giving away some fun products for virtual trick-or-treating! Make mud pit pizza using an allergen-friendly dough, chocolate sauce (mud), allergen-friendly gummy worms, candy corn, or other candies. Put out these fun orange and black tortilla chips so everyone can share dips and salsas without fear of cross contamination (note: corn can be an allergen). Tip 2: Focus on Orange and Black... and Teal Too! For both households with dietary needs and households without, here's something everyone can do to make the holiday better for food restricted folks: get involved with the Teal Pumpkin Project. Launched in 2014 by FARE (a food allergy advocacy organization), this movement promotes the inclusion of all trick or treaters. Anyone can get involved by putting a teal pumpkin by their front door (paint a pumpkin or print a sign right here) and stocking up with food allergy friendly, and even non-food treats to have on hand. 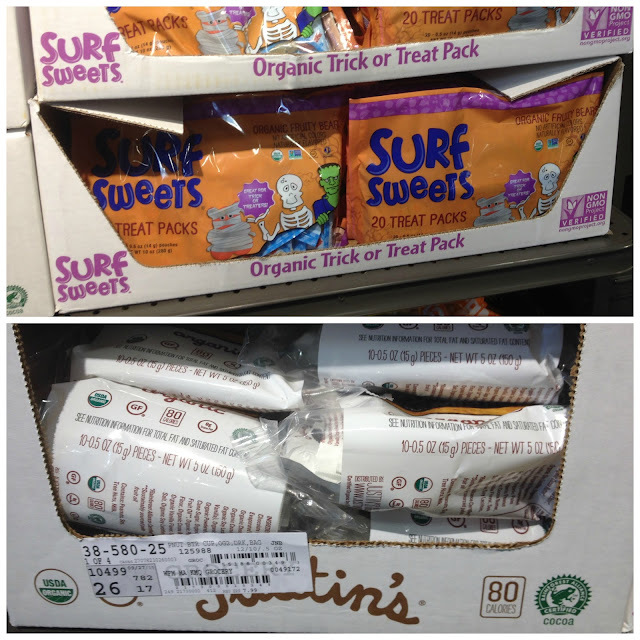 Suggestions for good Teal Pumpkin Project treats would be individually packaged allergen-friendly treats (such as the below offerings I found at my local Whole Foods), glow sticks, pencils, small stuffed animals, and other suggestions found here. While not every child in your neighborhood will need these special snacks, being able to serve all kids will make Halloween truly an inclusive affair. Do you have kiddos that would benefit from a Teal Pumpkin Project (TPP) friendly trick or treat experience? You can find a map of houses that have pledged to provide food allergy-friendly treats on FARE's website. Making your house TPP-friendly makes a real difference for kids in your neighborhood who want to feel "normal" during the childhood rite of trick or treating, but this simple action does not have to be the end of having a positive impact on your community this Halloween season. Are you always stuck with too much candy after trick or treating? Donate it to your local police station, Ronald McDonald House, or send if off to organizations that send candy overseas to troops. Have costumes from years past that do not fit anymore? Donate them to a local homeless shelter that serves families with children. While the holiday may be filled with fright, it's also an opportunity to share spooky fun with those in need as well. That being said, I've got some gluten-free Halloween fun to share with you my readers! Thanks to Enjoy Life Foods and Next Organics Chocolate, I am hosting some virtual trick or treating fun to spread the positive spirit of an inclusive Halloween. 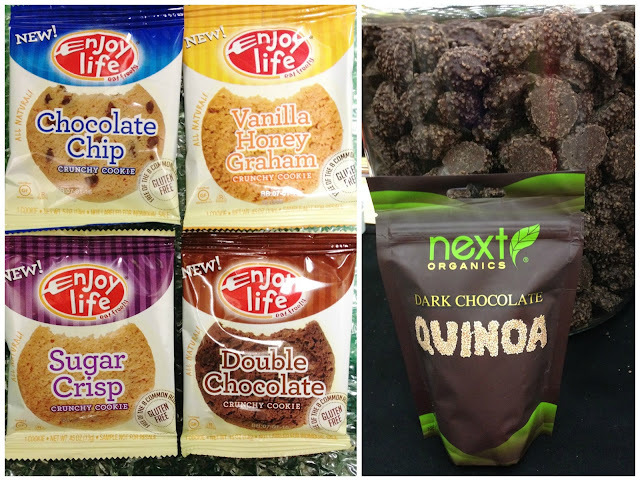 There are three prizes up for grabs, including two Enjoy life Foods individually wrapped cookie assortments, and a pick-your-own assortment of six Next Organic products. The Enjoy Life Foods cookies are top 8 allergen free. Next Organics has gluten-free, dairy-free, and vegan options in it's line up and a rep from the company will be able to assist you with selecting treats to meet your dietary needs once I have selected the winner. The giveaway closes Monday, November 2nd 2015 at 12:00 am. If you have any questions, do not hesitate to drop me a line! I love Yum Earth candy because they are gluten free. I also like to make my own cookies and treats, so I know what't in them and because they will be healthier.